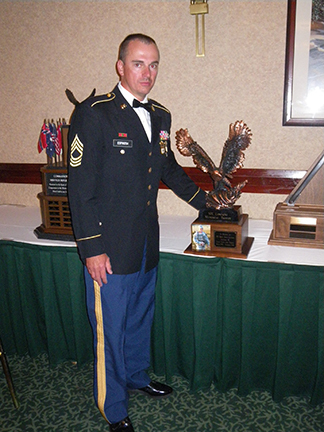 MSG Lance Espinosa of Skandia, MI won the Lantagne Memorial Trophy at the Armed Forces Skill at Arms Meeting. This win was doubly important, for it not only cemented MSG Espinosa’s overall individual victory at this tournament, the earned trophy was named in honor SFC Brent Lantagne, a close, personal friend and fellow team mate. Following his untimely death in 2008, SFC Brent Lantagne was forever memorialized with a trophy commissioned in his name by Lt. Col Pasquale Sperlongano, commanding officer of the United States Army Reserve Shooting Team. The Lantagne Memorial Trophy is an annual award presented at AFSAM, this year for the overall aggregate of Excellence In Competition events. MSG Espinosa, a top-ranking US Army Reserve team shooter, took first place in pistol overall and first place rifle overall. AFSAM, now in its third decade, is an annual international competition held for shooters in allied militaries. All NATO countries recognize this event and send teams to participate. SFC Lantagne was a sought-after instructor at the NGMTU and a top flight marksman, having been a member of both National Guard and Army Reserve shooting teams competing there. Shooting organizations have a long history of honoring noteworthy marksmen by establishing trophies in their name. At National and International-level competition top shooters and important contributors are recognized by their peers with trophies in their names awarded annually. Some of these have been presented continually since before World War One.